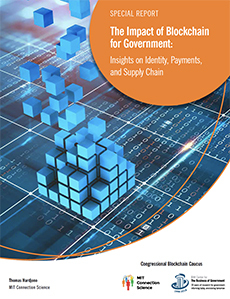 Today also marks the launch of a new report about blockchain released in consultation with the Blockchain Caucus and MIT Connection Science through the IBM Center for The Business of Government: The Impact of Blockchain for Government: Insights on Identity, Payments, and Supply Chain, by Thomas Hardjono, who leads the MIT Trust: Data Consortium within MIT Connection Science. Understanding blockchain’s potential relies on recognition that business transactions such as orders, payments and account tracking take place every second. Often, all participants to a transaction have their own ledgers — and, thus, their own individual versions of the facts. Having multiple ledgers can lead to error, fraud and inefficiencies — vulnerabilities that can be reduced by having a common view of a transaction end-to-end. Today’s report is intended to help government achieve goals set out in the congressional resolution, focusing on ways that blockchain can benefit agencies and drive economic vitality. The author addresses these and related challenges by drawing insight from three roundtable discussions in 2017-18 among key leaders and stakeholders, hosted by the Congressional Blockchain Caucus, under the leadership of Rep. Schweikert and Jared Polis (D-Colo.). The roundtables helped frame key issues, addressing how leadership and vision from government, collaboration with industry, and support for research into future applications can help drive progress in enabling blockchain technology to support digital identity, payments, and supply chain innovations. We hope that this report provides timely insight on the potential for blockchain to help government, as agencies expand their implementation of this important technology in the years to come.